PCB holds five each 9 Volt batteries in a very tight package with snaps that mate to a connector for a "455" battery. Similar to the Terralux adapter for the two AA Mini Mag Light except runs from a single AA cell. A PIC circuit that fits inside a connector shell and monitors some data packets coming from the Thrunderbolt. Flashes a LED once per second, Indicated if Locked to GPS, in holdover or recovering modes. Also indicates major and minor faults. Could be used for other things that depend on reading RS-232 serial data coming from a DB-9 connector. A version of the Battery Top Power Supply that includes an "A" type USP socket, like on a laptop. Although a rechargable 9 volt battery could be used the performance would be far better when 6 Ni-MH AA cells are used. Battery holders are available in a long stick of 2 side by side x 3 long or a brick where they are all side by side in a 2x3 array. For use in things like Self Winding Clock Co. 'Western Union" clocks, antique electric motors, telegraph equipment, school electrical hands on learning, etc. This battery is being optimized for low resistance and low cost. 30 Nov 2007 - Next wire up a few of the different battery configurations and run some tests. The idea is to be able to use the Maha MH-C401FS "AA" battery charger on other sizes of battery. This charger does an excellent job of charging. First Prototype shown 30 Nov 2007 - although the adapter meets the "AA" outline specs there are more constraints imposed by the C401FS and C9000 chargers. Need to order more parts and build second prototype. Ideally this would be done in a lather, but I'm doing it in a drill press. 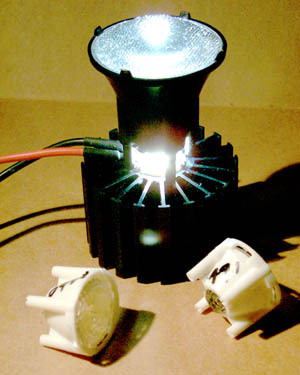 The idea is to offer an efficient source of light powered from a 5590 family battery. The photo shows the LED mounted to a heat sink and with three difrerent beam angle optics. What needs to be developed is the can to hold and protect the optics and LED and the switching mode power supply to convert battery power efficiently into the current to drive the LED.